While there are thousands of tattoo designs inked allover the world, the following top ten make the list of the trendiest and most popular choices amongst men and women. Whether you opt for a custom designed tattoo or would rather play it safe with a traditional piece, it helps to have inspiration before making any type of permanent mark on your body. Some people opt for unique and original tattoo designs, while others gain their ideas from the most popular selection. The following popular tattoo designs can be incorporated into a custom piece that will be enjoyed for a lifetime. Tribal tattoos consistently find themselves on the list of top ten tattoo designs. Their unique and intricate beauty, along with simplified ink work and coloring make them the perfect choice for someone who would rather opt for a statement-making symbol rather than a detailed picture or illustration. 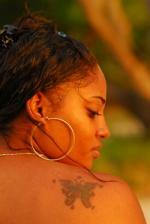 Tribal tattoos work for both men and women and are commonly worn as wrist, ankle and arm band pieces. 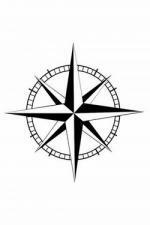 Not just for the sailors, nautical star tattoos have several underlying meanings. Popular amongst the pin-up and punk loving crowd, stars also serve as a sexual preference statement within the gay and lesbian community. Many marines also opt for nautical stars to represent their many years spent at sea. Hearts are a great choice for the true romantic wanting to pay homage to his or her significant other, mother or even their beloved pet. While hearts are a popular design amongst women, men can rock them too when masculine details are added within the body of the design. Angel wings remain the perfect choice for either men or women who find comfort in knowing they have a guardian angel or loved one looking over them. Whether the wings spread an entire backside or adorn the hip in a small dainty design, angel wings are a beautiful tattoo choice that is both timeless and personal. Just like angel wing tattoos, cross and religious symbols help express your faith in an artistic way. Wholesome tattoo enthusiasts opt for a simple cross design, others get creative with a strand of rosary beads encompassing an ankle tattoo. If you're considering a tattoo of your faith, make sure you're committed to your beliefs before getting inked. Dragons have several meanings, making them yet another one of the top ten tattoo designs. Dragons and their fiery nature send the message that you are strong-willed and defiant. The dragon is also a Chinese zodiac symbol for many people born in the year of the dragon. For wizard and sorcerer fans, dragons also make a unique fairy tale inspired tattoo. A fiery dragon makes a statement. Butterflies are a popular gal tattoo for good reason. Often representing rebirth and transformation, butterflies are also dainty with endless color combinations. Butterfly tattoos are perfect for the lower back, hip and ankle. While many people opt for a traditional flash art butterfly design, a custom piece can be created to signify even deeper meaning. A fanciful butterfly is dainty! For the gal with sense of whimsy, a fairy inspired tattoo is another winged choice. Known for their mischievous yet playful personas, fairies can also have a dark side making them a wonderful choice for a gothic inspired tattoo. Many people draw their own fairies and have their sketches translated into permanent body art. If you're considering a fairy tattoo, you may want to find inspiration for your design based on your birth month, your birth month flower or even birthstone. A combination of these elements can represent the color and style of your fairy, making it a wonderful and more unique version of an already popular design piece. A playful fairy is unique. 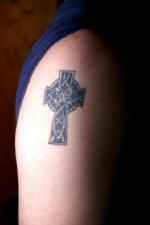 Just like religious symbols, Celtic tattoos have an ample following. The beautiful knots and scrollwork that create Celtic tattoo designs make them a wonderful choice for someone seeking a timeless tattoo with plenty of detail. The Claddagh love knot and eternity symbol are perfect designs for anyone seeking a couples tattoo. Celtic designs are unique and intricate. 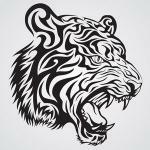 The leaders in the tough cat pack, the lion and the tiger are amongst the most popular top ten tattoo designs. Cat tattoos express royalty, fearlessness and inner strength, making them a suitable choice for nearly anyone who wants to express a wild side. Popular placement ideas for lions and tigers include the shoulders, back and calf. Whether you opt for a colorful tiger or keep it simple with a black and white piece, lions and tigers are sure to remain a timeless choice. A regal cat is always timeless. Whether you choose your tattoo inspiration from this top ten list or opt for a custom designed piece, you can make your tattoo even more meaningful by expressing your unique individuality within the body of the tattoo. Consider adding names, dates or even memorial statements to make your tattoo unique. If you opt for a tattoo flash piece, ask your artist to change a few elements of the design to make it more detailed and unique. Tattoos serve as permanent reminders of our beliefs and what's important in our lives. Find your inspiration and a unique way to express it, and you're bound to find the tattoo that's perfect for you, even if it doesn't make the list of the trendiest designs.